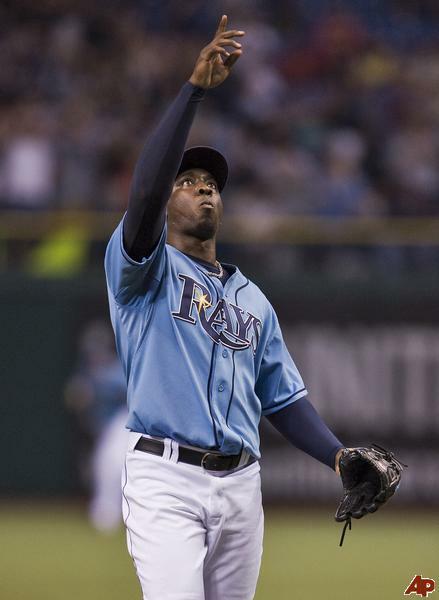 What a Relief: Would Soriano for Krod Swap Make “Cents” for Yanks and Mets? When Francisco Rodriguez slammed the door on the Yankees in last night’s Subway Series opener, the Mets’ players on the field and fans in the stands celebrated joyously. The executives in the front office, however, probably weren’t as jubilant. A Bronx-bound Krod could save the Mets a lot of money. Thanks to a lucrative option in Rodriguez’ contract, every Mets’ game that concludes with Krod on the mound brings the team closer to a financial disaster. That’s why even a win against the hated Yankees comes with at least a tinge of regret from those who write the checks. According to the option, if Rodriguez finishes 100 games over 2010 and 2011, a guaranteed salary of $17.5 million automatically vests for 2012. Because the closer polished off 46 games last year, the economic time bomb will be triggered when he finishes his 54th game this season. Last night was the 18th time the embattled closer was the last man standing for the Mets, meaning there are 36 games left to go. Tick, tick, tick. Regardless of how well he is pitching, you can bet Sandy Alderson & Co. are not relishing the idea of a $17.5 million closer in 2012. One solution would be to place pressure on Terry Collins to limit Rodriguez’ use, but that would not only lead to a public relations nightmare, but also another expensive lawsuit. So, unless Rodriguez develops an injury, there really is no way for the Mets to avoid triggering the costly option. Or is there? Krod currently has a limited 10-team no trade clause, so if the Mets could ship him to one of the other 19 teams, they’d be able to wash their hands of the option. Unfortunately for Alderson, teams probably won’t be lining up to add Rodriguez and his expensive 2012 poison pill. However, what if the Mets could find a team that wouldn’t need to use Krod as the closer, yet still being willing and able to pay him handsomely to serve as a setup man? The answer to that question is currently sitting right across the field. Would Soriano and the Yankees be better off if the reliever was traded to Flushing? Although the offense is by far the Yankees’ greatest concern at the moment (just ask Soriano; he’d be the first to tell you), the performance of Rafael Soriano has probably been a close second. The signing of the former Rays’ closer caused a rift within the organization when everyone expected he would pitch well setting up for Mariano Rivera, so you can imagine the dissension now that things haven’t gone according to plan. Because it seems unlikely that Soriano would exercise the opt out in his contract, the Yankees are staring at two more years of the grumpy reliever at a cost of $25 million. In many ways, the Soriano contract has become the Yankees’ very own ticking time bomb. The Yankees and Mets are not frequent trading partners, but in this case, it seems as if each team has the answer to the other’s problem. Assuming the Yankees are not on Krod’s no-trade list, why not simply swap Soriano for Rodriguez? At face value, the idea probably seems a little silly, but consider the financial ramifications. The cornerstone of the idea is a trade to the Yankees would effectively end any chance of Rodriguez reaching the 2012 option guarantee, thereby converting a $17.5 million salary into a $2.5 million buyout. The next step would then become determing how best to divide the savings. Note: 2011 figures are pro-rated salaries. The 2012 amount for Rodriguez in the proposed structure is a $2.5 million buyout. If Rafael Soriano felt unwanted at his introductory press conference, just imagine the thoughts going through his head as he walked off the mound to a chorus of 40,000 boos during yesterday’s 3-2 loss to the White Sox. 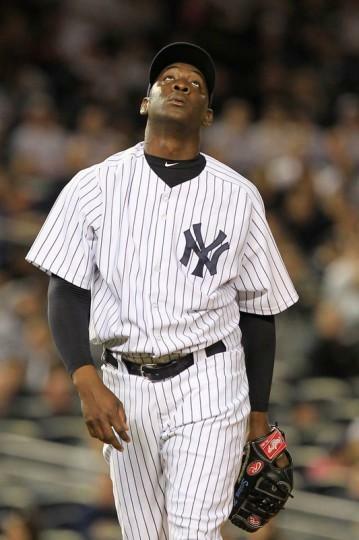 Things haven’t been looking up for Soriano in his first month as a Yankee (Photo: Getty Images). When Soriano signed with the Yankees as a free agent back in January, there were many reasonable objections. The size and length of the contract was first and foremost. Considering his lack of leverage, it didn’t seem as if the Yankees needed to give him three years at $35 million, not to mention an opt out after the 2011 season. Money wasn’t the only issue, however. 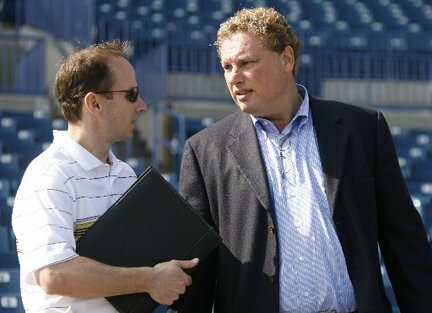 Others focused on the first round draft pick that the Yankees had to forfeit to the Rays, while another faction simply bristled at the idea that Randy Levine would involve himself in baseball operations. Amid all of the dissent, no one ever disputed Soriano’s ability to pitch because it would have been a foolish argument. Not only was the right hander coming off a season in which he led the league in saves, but his entire career record pointed toward a dominant pitcher when healthy. Even Brian Cashman, who disavowed the signing for many of the reasons cited above, conceded that Soriano’s addition to the bullpen made the Yankees better. Unfortunately, things haven’t exactly gone according to plan, regardless of whose plan it really was. In only 10 1/3 innings, Soriano has already allowed nine earned runs, which is only three fewer then he surrendered all last year. He has also had two very high profile meltdowns as well as one run-in (or run out) with the media. In other words, it hasn’t exactly been a smooth transition to the Bronx. Yesterday, the Yankees died by the double play. Today, it gave them new life. Freddy Garcia was all smiles after recording his first Yankees’ win. In a scenario eerily reminiscent of last Tuesday’s 5-4 loss to Minnesota, the Yankees took a substantial lead into the eighth inning, but watched as Rafael Soriano gradually frittered it away. With two runs already across the plate, Adrian Beltre lofted a long fly ball down the right field line that missed being a three run homer by about three seats. Disaster narrowly averted, Soriano escaped further damage by getting the Rangers’ third baseman to ground into an inning ending double play. 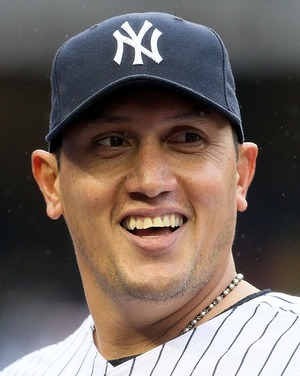 By escaping the jam, Soriano was able to preserve Freddy Garcia’s first victory as a Yankee. Over six strong innings, Garcia not only kept the Rangers off the scoreboard, but practically kept them off the bases altogether. Going into the game, there was some concern about how Garcia would respond to an almost three-week layoff (sans one relief inning), but the right hander featured a well located mid-80s fastball as well as a steady diet of even slower changeups and sliders to keep the Rangers off balance. His effort was only the fifth quality start turned in by a Yankee, and it couldn’t have come at a better time. Joe Girardi welcomes Rafael Soriano at his press conference, but the sentiment of Brian Cashman’s comments was not as warm (Photo: MLB.com). Rafael Soriano may not be asked to save many games for the Yankees, but at the press conference announcing his signing, Yankees General Manager Brian Cashman was forced to save face. The biggest news from yesterday’s media gathering was not the player being introduced, but the back story behind his acquisition. As has now been widely reported, Brian Cashman was not on board with the decision to sign Soriano because he wanted to protect that first round pick that was ultimately forfeited to the Tampa Bay Rays as compensation. So, it was with great anticipation that media members gathered at the press conference to grill Cashman, and not the Yankees’ new reliever. Despite his frankness, yesterday’s media event couldn’t have been very comfortable for Cashman. After all, it’s not easy to listen as your authority and autonomy are called into question. Although he seemed at ease with the decision, the now public split could put both Cashman and the organization in line for more uncomfortable questions as the general manager enters the final year of his three-year contract. For Soriano, the introduction must have been a little surreal. Not only was he forced to play second fiddle at his own press conference, but then he had to sit by as the team’s general manager talked about having him forced down his throat. Hopefully, the Yankees instructed the interpreter (Soriano answered all questions in Spanish) to not use a literal translation. If he is even the least bit sensitive, a comment like that could make Soriano’s transition to the team a little more uncomfortable. Perhaps anticipating some of the potential awkwardness, the Yankees decided not to air the press conference on YES. Of course, that did little to quell the stories about the latest bizarre happening in what has been a very unorthodox offseason for Cashman and the Yankees. Immediately after the signing was announced, I noted the potential negative ramifications that could result from the emergence of a split in the Yankees’ baseball operations. As Craig Calcaterra of NBC’s HardBall Talk replied, however, the decision by Hal Steinbrenner to override Cashman’s recommendation really wasn’t unprecedented. Both before and since Cashman demanded more autonomy from the Boss, the Yankees utilized a committee approach to making decisions. As evidenced by the Joe Torre situation, Cashman has not always gotten his way, even on matters as significant as hiring a manager. 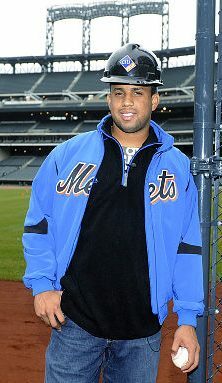 Viewed in that light, the Soriano signing really shouldn’t be considered so ominous. As he noted at the press conference, Cashman was fully aware of the negotiations, despite not being in favor of the transaction. In other words, he was not bypassed in the process, as had been the case during the days of Billy Connors and the Tampa faction (not to mention signings like Gary Sheffield and David Wells that were almost exclusively transacted by the Boss). As long as the Yankees maintain a chain of command in which Cashman presides over all baseball recommendations, it shouldn’t be an issue when the owners of the team decide to go in a different direction. Finally, because of the uniqueness of the situation, it’s easy to see why Cashman and the Yankees have been held to more scrutiny on the matter, but the reality is every single ownership group plays a role in baseball personnel decisions. The only difference is that with 29 other teams, ownership’s constraint revolves around saving money, not spending it. As Cashman noted, it really isn’t a negative when your owner is willing to spend beyond your recommendations. If the Yankees had given Cashman a mandate to cut spending, no one would view it as a blow to his autonomy, so the same inference shouldn’t be made because the Yankees collectively decided that signing Soriano was an affordable cost of doing business. If Cashman had expressed concerns about Soriano’s ability or his clubhouse presence, then there might be reason to worry about the Yankees’ decision making process. However, when the owner overrules the general manager on what essentially amounts to a financial decision (and does so in order to spend, not save, money), the organization and fans alike should be grateful. After all, there’s nothing wrong with having your cake and eating it too…even when it’s forced down your throat. In honor of Rafael Soriano’s official unveiling as the Yankees’ 2011 “eighth inning guy”, listed below are the most dominant seasons by a Yankees’ reliever with fewer than 20 games finished. Note: Excludes relievers with games started greater than 0 and games finished greater than 20. Assuming Mariano Rivera remains healthy, Soriano will have the chance to gun for the immortal closer’s 5.4 WAR, which was compiled asJohn Wetteland‘s set-up man in 1996. At the very least, he’ll be expected to make up for the loss of Kerry Wood, whose contribution was pretty incredible in only 26 innings. Along with Rivera, Soriano will join two other relievers on this list: David Robertson and Joba Chamberlain. If all three right handers can pitch to top form, the Yankees bullpen could feature the best quartet in recent memory, not to mention one of the better one-two punches in franchise history. For a look at some of the best reliever tandems in Yankees’ history, check out an earlier Captain’s Blog post chronicling the unique 1981 season of Ron Davis. 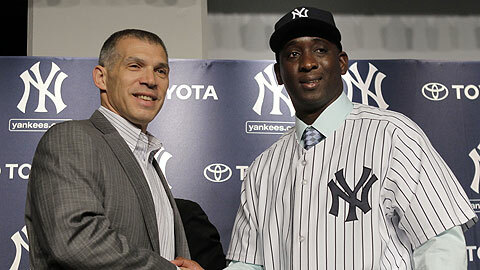 Soriano Signing Makes Yanks Better on the Field, but Does it Reveal a Split in the Front Office? All winter, Brian Cashman has taken his lumps for patiently biding his time during the off season. However, those criticism were nothing compared to harsh rebukes he has received in the hours since John Heyman announced that the Yankees had signed Rafael Soriano. According to reports, Randy Levine and Brian Cashman may not have seen eye-to-eye over the Soriano contract (Photo: The Star-Ledger). Before delving into the wisdom of the signing, the pink elephant in the room is Cashman’s earlier insistence that the Yankees would not surrender a first round pick for any free agent not named Cliff Lee. So, either Cashman was holding his cards close to the vest (i.e., lying), had a serious change of heart, or was overruled by another in the organization. If Cashman was being deceptive, well, good for him. His chief responsibility is to make the Yankees better, so if that means throwing up a smoke screen or two, so be it. Unfortunately, it’s hard to see where the Yankees benefitted from an improved negotiation position, but then again, the full details of the contract and pursuant negotiations have not been revealed. Nonetheless, a general managers’ commandments are made to be broken when the right (or sometimes wrong) deal comes along. Just ask Bubba Crosby. As mentioned, the exact terms of the Soriano contract have not yet been divulged, so in the details may be the reason why Cashman did an about face from his earlier vow. Maybe he believed that Soriano would return to the Rays at a discount, or sign with a wild card competitor? Perhaps further evaluation of the draft revealed less than promising prospects for the 31st pick? Maybe it was Andy Pettitte’s latest display of indecision that pushed his hand? Or, it could be that Cashman has other contingent moves in place (e.g., moving Joba Chamberlain back to the rotation, or a trade that involves the team’s now impressive bullpen depth)? Regardless, just because Cashman changed his mind doesn’t mean he panicked. The third option is the one that is cause for real concern. In his daily column, Buster Olney hinted at a divide within the Yankees organization, while Peter Gammons tweeted that Randy Levine was the driving force behind the signing. Even Mariano Rivera has been credited with holding sway. If true, that could be disastrous for the Yankees. Whether you like Cashman or not, the Yankees have seemed to benefit from having one coherent voice on baseball-related matters, so a return to the days of front office factions could have undesirable consequences. I am sure more on that topic will be written in the coming days, but usually when there’s an early leak, there’s also an unhappy general manager. Putting aside the intrigue behind the Yankees’ change in course, let’s now return to an examination of the player and the contract (for a concise rundown of how the Yankees blogosphere has reacted to the deal, check out Bronx Banter). The biggest criticism of the deal has dealt with the fact that Soriano does not address the team’s greatest weakness, which, of course, is the starting rotation. But, should that really make a difference? The Yankees did not get Cliff Lee, nor were they able to trade for Zack Greinke or Matt Garza. Nothing can change that reality, and there are no apparent acquisition targets capable of filling the resulting void. Instead of focusing on a cadre of has-beens, also-rans, and could-bes, the Yankees instead decided to bolster the backend of the bullpen with a bonafide quality reliever. Granted, the contract, which at $11.7 million per year makes Soriano the third highest paid reliever in the game, seems exorbitant, but should that matter to anyone but the Yankees’ accountants? After all, just because he will be paid closer money doesn’t mean he won’t be very valuable pitching in the eighth inning. When you are a billion dollar franchise in an offseason when no one else will take your money, you can afford that kind of luxury. Another knock on the contract stems from the fact that Soriano has had Tommy John surgery, but since undergoing the procedure in 2004, he bounced back with healthy seasons in four of the last five. In 2008, however, Soriano missed most of the season and eventually required another elbow surgery, so the risk is definitely real. But, again, that’s really a financial concern. 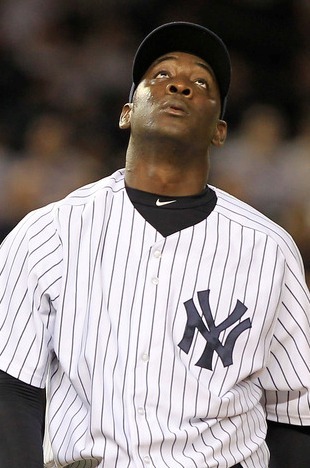 Does Soriano have a higher power (Mariano Rivera) to thank for his contract with the Yankees? Statistically speaking, it’s nearly impossible to justify the monetary terms of the contract, so once you get past that hang-up, the bottom line becomes that the Yankees are a better team with Soriano than without. Even if one wanted to boil down the addition in terms of value added, it could be argued that if he pitches as he did in 2010, Soriano would come close to approximating the contribution that would be lost if Andy Pettitte does in fact retire. Also, in addition to giving the Yankees one of the major’s best bullpens, it also provides the team more flexibility, both in terms of whom they can move into the rotation and how much rest they can afford Rivera. There is a domino effect at play, and although the benefits don’t trickle down enough to match a $12 million outlay, the addition of Soriano does strengthen the team. Perhaps the most legitimate criticism of the deal centers around losing the 31st pick in the 2011 Rule IV draft. It should be noted, however, that the Yankees still have a supplemental round pick thanks to the departure of Javier Vazquez. So, if the draft really is as deep as many experts have suggested, the Yankees should still have enough quality selections to replenish their farm system. Finally, much has been made of Soriano’s opt out clauses, which allow him to terminate the deal after the first two seasons AND be paid a $1.5 million buyout for his troubles. Although this may seem to be a very one-sided perk, it actually gives the Yankees an out in the event that Soriano has a terrific 2011 season. Because the contract is end-loaded, it isn’t likely that Soriano’s future performance would ever surpass his salary, so if the right hander were to allow his ego to send him back into the free agent market, the Yankees would be freed of the risk associated with the length of the deal. In other words, the Yankees would wind up with one great year from Soriano and Type-A free agent compensation, which means they’d swap one draft pick for two. Should that happen, the Yankees’ end of the bargain would look much better, which is exactly why the opt outs are probably more in their best interest than Soriano’s (i.e., it provides him with a temptation that isn’t likely to work toward his benefit).